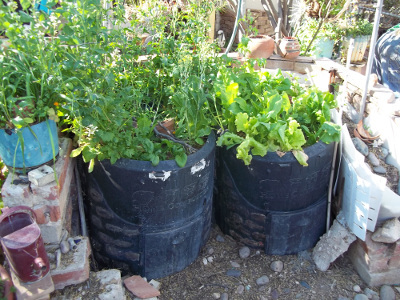 I want to give a workshop for every community garden in Tucson and every gardening group on my LOW WATER LOW LABOR COMPOSTING TECHNIQUES. I'm passionate about conserving water and diverting good earth and soil building materials from a land fill fate into healthy good soil. 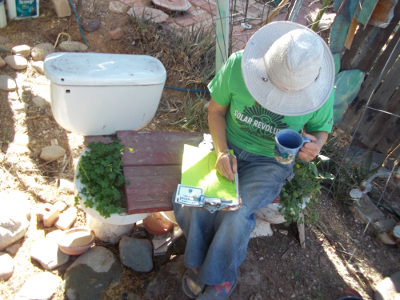 I teach workshops on low water low labor desert composting. 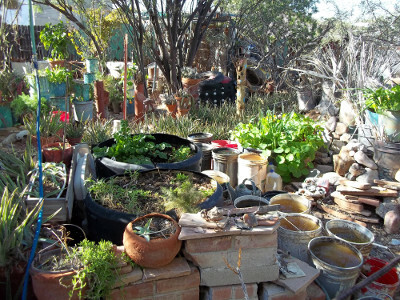 Imagine NO yard or kitchen materials in the land fill and you make your own soil with minimal water. 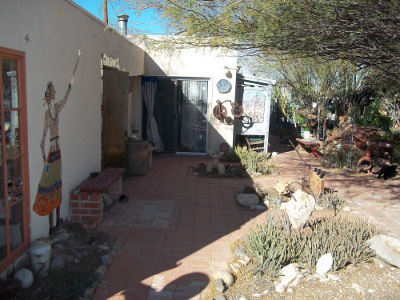 Tucson can be full of locally produced top soil with a vegetable garden in every yard. 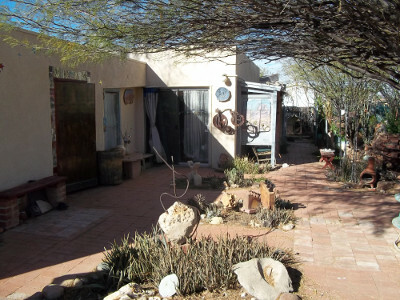 I have 8 compost bins and 18 square feet of vegetable garden on my small Tucson property. I have 5 chickens that make me breakfast. Two years ago I upgraded from passive water harvesting to six rain barrels. 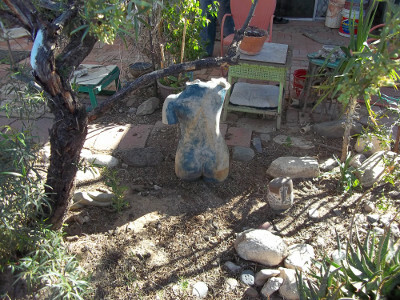 I teach workshops on painting rain water barrels and salvaged garden tools, buckets and such into designer garden tools and I give garden tours showing examples of water saving landscaping. I moved heat absorbing bricks from a patio that receives only summer sun. Last year I put in 6 solar panels. Although most of my sustainable life style enhancements are inexpensive “do it my self projects”, the solar was the biggest investment in my life other than my house. I get a kick out of re-purposing odd materials into furniture and garden furnishings and clothes. I bought plants or seeds and grew them in commercial potting soil; I bought organic foods at Farmer’s Markets... My compost was dry and took 2-3 years to make soil. I used every piece of non poisonous yard trimmings and rakings to fill compost bins friends gave me when their efforts to compost in the desert weren't very successful. I rehabbed compost bins that were designed for wetter climates to bins that conserved and held in moisture. I added a few inches of soil to the tops of four bins and planted vegetable seeds. By the time the roots grow deep the compost under the soil will be mostly soil itself. I grow more than enough vegetables for myself and I sell bags of greens or feed the excess greens to the chickens. Some plants I allow to go to seed and harvest seeds for the next planting season. Each compost bin produces great growing soil for earth about every four months. After the compost materials have processed into soil I sift the contents of bins. The large chunks that haven't finishing composting into soil are added to the next compost mix and reloaded into an empty compost bin. The larger chunks are filled with the live microorganisms that serve as compost activator for the fresh materials. I produce more good soil than I can use; I sell the rest. Friends donate their yard trimmings for my compost bins and their kitchen scraps for my chickens. More and more folks want their kitchen and yard waste put to good use for either animal feed or compost instead of wasting away in the landfill. You've probably guessed the compost in the bins under the gardens ages for up to six months. I don't know what it is about composting and gardening but I feel so peaceful and happy working in my garden. 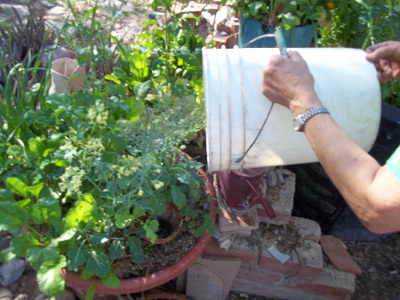 I place empty planters among the garden plants and can pour rain water in them quickly to water deeply. The water slowly soaks into the soil. When I read of the horrible conditions commercial laying hens endurebefore they are dumped as non productive while still young, I couldn't, in good conscience eat their tasteless supermarket eggs. But I love omelets and egg sandwiches and I prefer egg protein to meat. I bought organic eggs from other people with micro city flocks. I have 5 chickens living in a 10 x 5’ dog kennel, safe from hawks and rude neighbor dogs. 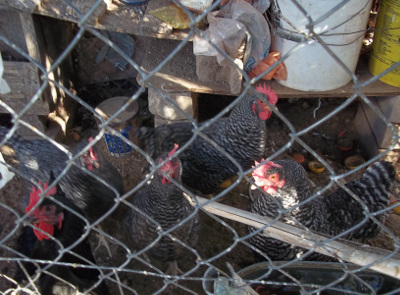 Tucson’s chicken ordinance requires chickens to be contained. That sounds so silly; what harm could chickens do except poop. An acquaintance couldn't grow a garden due to marauding chickens from her neighbor's yard. The chickens flew over the wall and wiped out her garden year after year. Marauding chickens, what a concept. So many folks insist their chickens have never been harmed wandering loose, until they are and then it is very ugly. My chickens have roosting rods. I use old broom handles for the smaller chickens and larger wood dowels picked up off the streets and alleys for roosting. The rods slide in the chain link walls of the dog kennel and are easily rearrangeable. 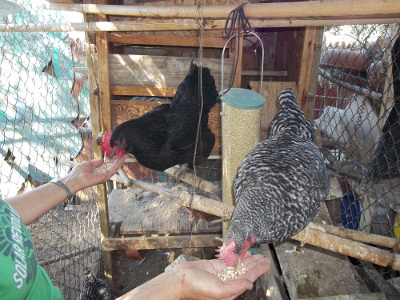 I cut two of the rods short, attached wires and made swings for the chickens. I thought the chickens would enjoy swinging on them like caged birds. They don't but instead they have trained me to hand feed them corn rich scratch if they jump on the swings. I found one group of nesting boxes on the curb; the other is made from an old wood crate. The bottom is hinged and I can easily drop the bottom open to change the nesting material. The nesting boxes filled with shredded office paper that I later compost when it’s dirty. 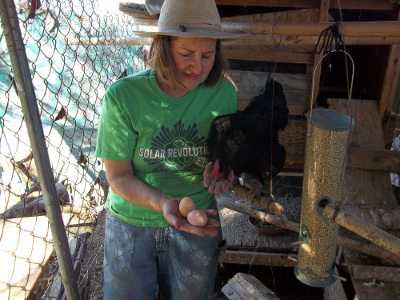 The chickens can fly to the nesting area, hop from roosting rod to rod or walk up a ramp ladder I made for my old dog when she could no longer jump in my pick up. Over the years I’ve bought or adopted abandoned chickens. They live out their life with me. My oldest chicken is over 20 and was still laying eggs at 18 years old. She isn’t laying, I consider her retired but you never know, she might lay again. No chicken is kept in inhumane conditions or has to die young for my breakfast. Old window and door screens make great shade for the chicken yard in the summer and store away flat in the winter. All roosts, laying boxes, ramps and food storage buckets are made of reclaimed materials picked up in alleys and Bulky & Brushy neighborhood clean ups, except for a new screw here and there. 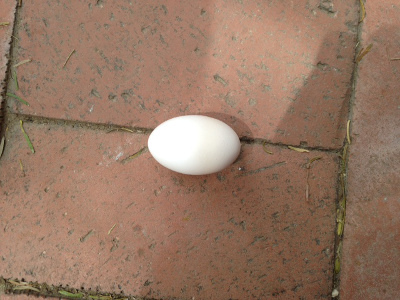 “Old chicken” is still laying. These tapered shapes are her new idea of retirement. She is amazing. I sculpted my yard with berms and removed soil to prevent rain water from running off my property down the street. So much technology, like landscape design isn't designed for the desert. Most home developments or custom home landscaping is designed run off all rainfall which is suitable for wet climates not Tucson AZ. I caught rain in buckets off a shed roof and enjoyed the musical percussion of dripping water in bucket before I installed gutters. 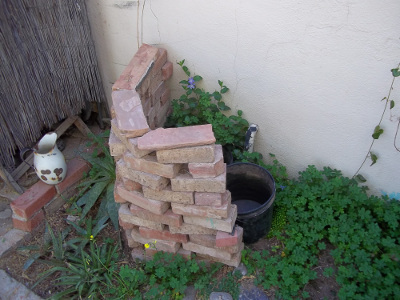 I saved water in the house waiting for it to run hot, I installed a draining outdoor tub for winter and summer bathing or relaxing that drains into the garden. I toted laundry water in buckets to my landscape plants and now I have gutters that catch the water from my roof and direct it into barrels. I keep my gardens small, just enough for myself and a few guests. Growing lots of vegetables I can’t use wastes water. I have six rain barrels on my property. My total roof space is less than 1000 square feet. Folks think making sustainable adjustments to our live style requires lots of money, but I've found I can do most of the work with reclaimed materials with little expense. I did splurge and hire an adorable fellow to add connectors and hose outlets for my rain barrels. 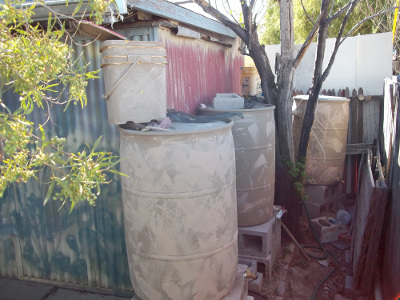 My rain barrels are 55 gallon plastic kegs from soft drink companies or car washes and were several colors. A few years ago Habitat for Humanity sponsored a fundraiser selling artist painted rain barrels. I painted a rain barrel to look like a stone well. I enjoyed 40 hours painting faux rocks, it was beautiful, but for myself I invited my two best friends, Jim and Paul over, we slapped on primer and a few layers of tan and beige paint in a textured neutral pattern that blends with my home. Only two of the barrels are visible from my yard or kitchen. I used old 3 gallon cat litter buckets to settle the dirt and leaves from the roof downspout before the water pours into the 55 gallon barrels. An upside down clay pot inside the cat litter bucket allows the dirt to settle. Of course the cat litter buckets are painted to match. The overflow water pours out of a slot cut in the top of the cat litter box into the top hole of the 55 gallon rain barrel. A piece of screen over the hole in the top of the barrel keeps the leaves out of the rain barrel and my hoses flow easily. Painted rain barrels with matching cat litter bucket on top under roof drain spout... The cat litter bucket with an upside down planter inside settles out the dirt and gravel before the overflow fills the rain barrel. My tiny (480 Sq. Foot) post WW 2 house built in 1954 is cinder block plastered inside and out without additional insulation. Two sliding glass doors one facing east and one west makes this house a solar oven. But only in the summer, sunlight doesn't hit the sliding glass doors in winter. RATS. I'm noticing a design trend; I call it “energy stupid.” I installed awnings over both sliding glass doors and made exterior curtains of mold resistant fabric that I open and close myself when the sun directly hits the glass early mornings and late afternoons. HUGE difference. I stop that heat before it hits the glass. The south wall of my home isn't visible from my yard. I noted where the winter sun struck the wall and more importantly where the summer sun didn't shine on the wall and I painted the winter section of wall flat black. In the winter my interior walls still radiate heat into the house from that black painted cinder block at 10PM. 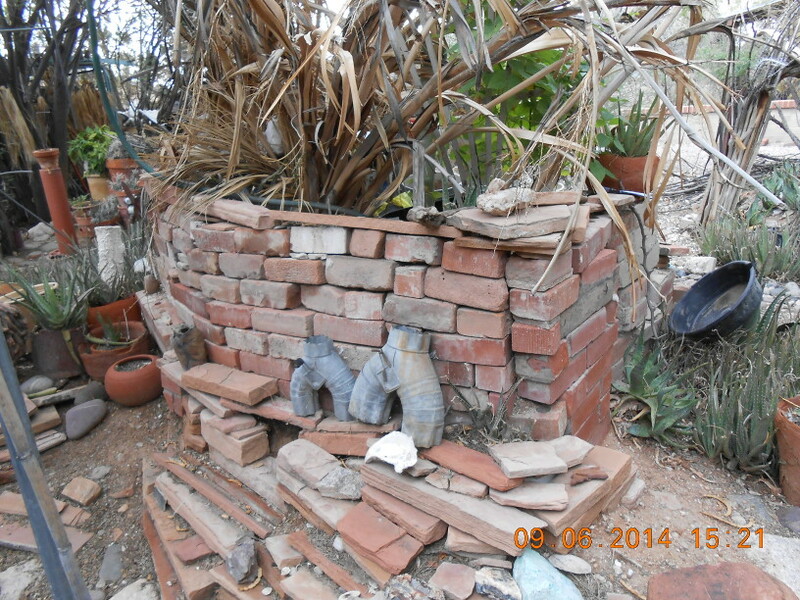 I noticed my lovely brick patio also gathered too much heat and only in the summer. “Energy Stupid” strikes again. 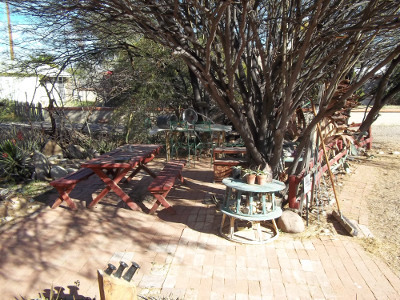 I pulled out bricks, planted islands of mulch and native plants to cool the area and repositioned the removed bricks to extend a patio further from the house under Mesquite trees. When tree roots raise the bricks I remove raised bricks and replace them with cobble stones. The result: no raised bricks to trip over, no tree roots to cut and attractive cobblestone patterns in my patio. I've considering removing most of the gravel in my yard and replacing it with cooler desert mulch I gather myself. 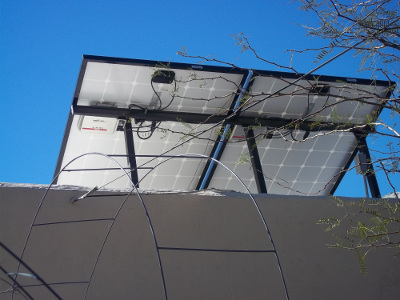 I bit the bullet and put solar panels on my home, I hired a local company, Technicians for Sustainability. My six panels make more energy than I'm using so I'm feeding energy back into the grid. I always conserved energy and I most likely won't save money in the long run, I save money by conserving. The decision to put in solar panels was a moral one and an exercise in spending money on me. As an artist I learned to keep my business and personal overhead LOW LOW LOW and save every penny. So I had savings and paid for the panels with checks. I know my electricity is clean, I'm not contributing to nuclear, or coal generated electricity. What else would I spend my money on, clothes, vacations, designer dogs, drugs? I've made benches of wood planks on blocks or old toilets. I use the tanks of the toilets as planters. I stack discarded planters on top of each other to create garden islands and visual partitions. Palm fronds make great screens.I sew. I enjoy altering clothes. Friends give me their old clothes, I either tailor them to fit me or I modify them into different wearable items creating my own style and one of a kind clothes. 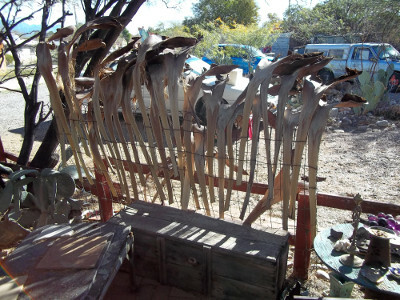 Scrap plywood cut into prickly pear shapes and painted extend a split rail fence. I removed the shirt sleeves and made plastic bag dispensers by putting a rubber band on the top and pulling the bags out the wrist opening. The rubber band comes off for bag reloading. These fit between my fridge and the wall. 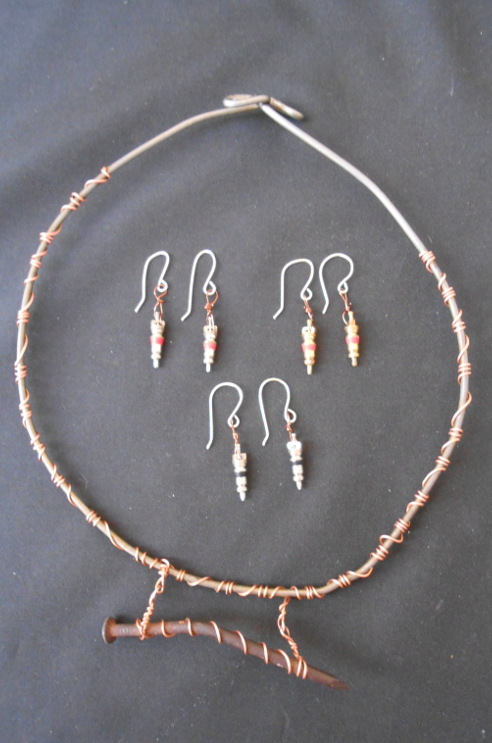 I could easily stitch a loop hanger on them to use in other locations. Other sleeves I use as shoe travel bags. 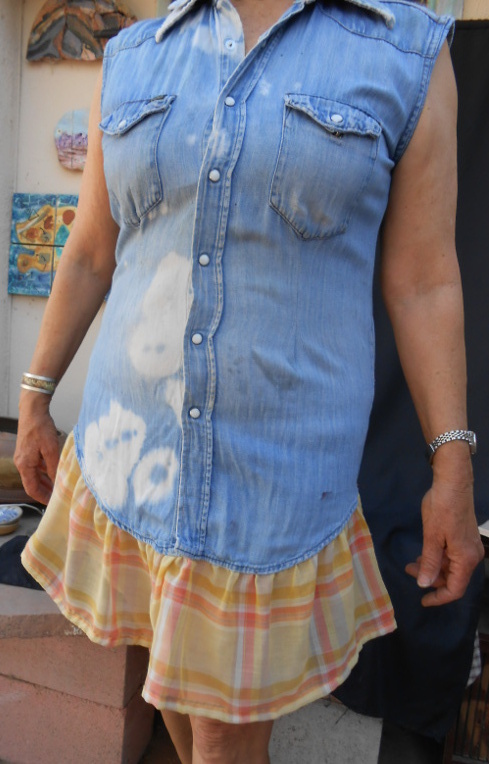 I've made vests tunics, sleeveless shirts and shirt dresses out of the shirts. Tunics are the easiest, just hem the sleeve holes and maybe cut the hem level. Dresses take a bit more planning. I usually want something I can dance in. The first shirt dress I made by adding a gathered ruffle made of an old curtain liner. I made reusable grocery produce bags with the rest of the sheers curtain liners. I also inherited my fathers stack of monogrammed white handkerchiefs. After I dyed them pale blue I discovered different monograms. Apparently my father inherited his father's handkerchiefs. I folded five of them into triangles, gathered them slightly and sewed them to the drop tails of a sleeveless shirt with slight overlaps except for the peek a boo left thigh. The Levi flared shirt dress was designed by tracing a pattern from a 6 section faired skirt I enjoy dancing in. As I wear out my work pants to shreds the only usable section of material left to salvage is from the knee down in the backs. Perfect sizes for the faired drop skirt I used above. I used this same premise for a skirt made of a pair of pants a larger friend ripped out in the seat. When I took them in the seat by removing one belt loop and re stitching the back seam to fit me the rip was gone. This skirt even has a hammer loop but I usually don&apos;t need a hammer on the dance floor. All these shirt dresses can be slightly redesigned at waist height if a drop skirt is not desired. I wanted simple, minimal additional fabric and a loose comfortable fit. Tighter tailoring below the bust and at the sides might require extra snaps added between buttons to prevent gapping. Future old jeans projects include tool aprons, very simple just cut off below the pockets and hem, kitchen aprons, tiny purses and shoe travel bags made of the lower leg sections of pants. Stay tuned for tips and thoughts on shelter, clothing and practical uses for almost anything. Please list date, number of people attending with you and a Tucson contact phone number or email address. 2627 N. Geronimo Ave., North of Grant, South of Glenn, East of Stone. West of First or Euclid. 2627 is on the west side of Geronimo. Look for signs.